El Rio Preserve is a 104-acre site located in the Town of Marana along the west bank of the Santa Cruz River. It is an important link in the chain of preserved riparian habitats. Project improvements will include two new ponds with a recirculating water feature between the two ponds, berms and swales for water harvesting and stormwater management, creation of wildlife habitat, increased planting of riparian species, and visitor amenities. Pima County Flood Control plans to rebuild the 25-year bank protection prior to this project to reduce future flooding in the project area. Above: The existing informal pedestrian path will be improved as part of the El Rio Preserve project. As part of the long-term masterplan vision, the seasonal ponds in the background will become part of a permanent wetland system. WDG was scoped to design an appropriate balance between passive recreation and community amenities, and ecology and habitat restoration. Specific scope objectives include planting and irrigation plans as well as design for visitor amenities such as seating areas, walking trails, bird viewing platforms and a small amphitheater. WDG also provided the Town of Marana phased plans in order to meet short-term and long-term construction goals. 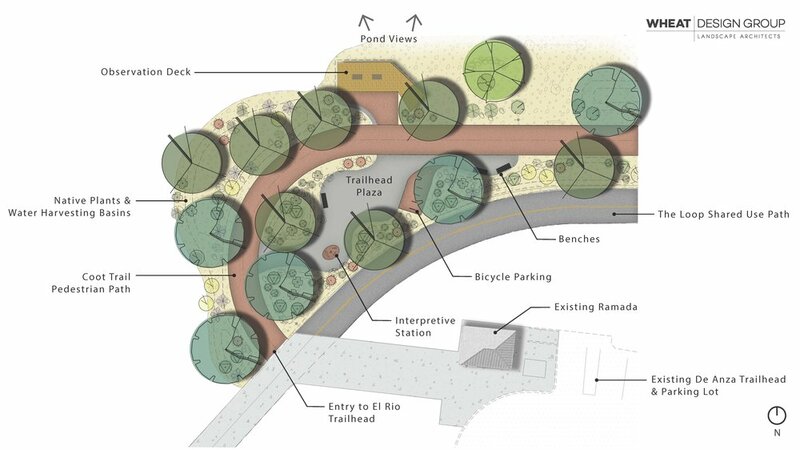 Above: Adjacent to the El Rio Preserve is the Loop Trail and the De Anza Trailhead, also designed by WDG. Above: El Rio Preserve is a valuable site for bird-watching enthusiasts from all around the world. Above: WDG created a plan view rendering of the proposed El Rio Preserve Trailhead to be used to advocate for public support of the project. The Trailhead is adjacent to the Loop Trail and would effectively connect these two recreation areas. Above: WDG created a perspective rendering of the proposed amphitheater. An amphitheater would allow for larger gatherings and recreation tours and could serve as an outdoor classroom for students.